Widow says he was a "brother and friend to many around the world." TOKYO — The Ministry of Foreign Affairs of Japan on Sunday issued the following statement from Prime Minister Shinzo Abe regarding the death of journalist Kenji Goto, the second of two Japanese hostages executed by the Islamic State. “A video purporting to show that Mr. Kenji Goto was murdered was uploaded online, following Mr. Haruna Yukawa. When I think about the unbearable pain and sorrow that his family must be feeling, I am rendered simply speechless. As a government, we have pursued every possible means to save their lives. We feel greatest sorrow and profound grief. “I am infuriated by these inhumane and despicable acts of terrorism, and resolutely condemn these impermissible and outrageous acts. I will never forgive these terrorists. I will work with the international community to hold them responsible for their deplorable acts. “Japan will never give in to terrorism. We will further expand our humanitarian assistance in the Middle East in areas such as food and medical care. Japan will steadfastly fulfill its responsibility in the international community combating terrorism. “I wish to express my heartfelt gratitude to the world leaders, our friends, who have kindly extended their strong solidarity against these acts of terrorism and cooperation toward the release of the hostages. “My family and I are devastated by the news of Kenji’s death. He was not just my loving husband and father to our two beautiful children, but a son, brother and friend to many around the world. “While feeling a great personal loss, I remain extremely proud of my husband, who reported the plight of people in conflict areas like Iraq, Somalia and Syria. “It was his passion to highlight the effects on ordinary people, especially through the eyes of children, and to inform the rest of us of the tragedies of war. “I would like to thank everyone who has offered their support to myself and our family over these last difficult few months. “The United States condemns the heinous murder of Japanese citizen and journalist Kenji Goto by the terrorist group ISIL. 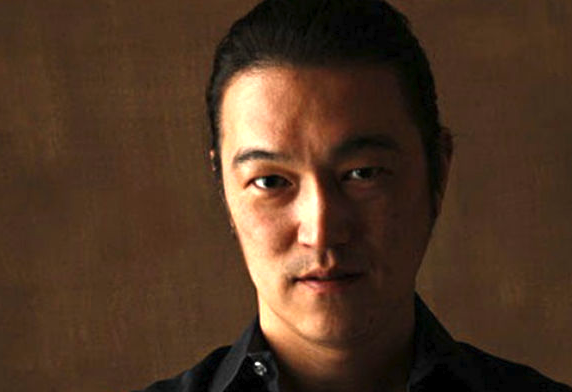 “Through his reporting, Mr. Goto courageously sought to convey the plight of the Syrian people to the outside world. Our thoughts are with Mr. Goto’s family and loved ones, and we stand today in solidarity with Prime Minister Abe and the Japanese people in denouncing this barbaric act. “We applaud Japan’s steadfast commitment to advancing peace and prosperity in the Middle East and globally, including its generous assistance for innocent people affected by the conflicts in the region.